Pegasus Airlines promotion - up to 40% discount all flights! Turkish low-cost carrier Pegasus Airlines have just released amazing one day promotion. They are offering up to 40% discount on all international flights to all destinations! Consider to use their service to countries such as Turkey, UAE, Iran, Kyrgyzstan and more.. .This promotional campaign is valid for all domestic and international flights. Deal is valid only for bookings made directly at website of the carrier. They are connecting Turkey with rest of European countries such as UK, Germany, Netherlands, France, Denmark, Italy, Sweden, Spain etc.. For instance you can book roundtrip tickets from London to Istanbul for £89. (When travelling with hand luggage only). 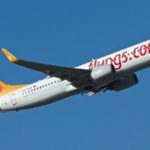 How to book this Pegasus Airlines promotion. Firstly note that this offer is available only till 22nd of April 2019. Travel dates are from 17th of September to 24th of October 2019. In case of booking or to read full conditions of this promotion you can follow here directly to the website of the airline. Important. : This deal is only available for Pegasus BolBol members. Free to join – you can apply here. Once you choose your flight then proceed to last step “Payment”. Right above your price summary you would find separate Campaigns box Your Special offers. Choose “All Routes 40% off” and confirm to use it. Just click it and your price will be automatically discounted by up to 40%.. If you want to book your flight to destination out of Turkey (e.g. London – Bishkek) you can not use flexible search. Instead you need to search day by day and find the cheapest solution available. Their website is very slow at this moment. you can also use their mobile application if interested in this promotion..
Booking sample of successfully applies Pegasus Airlines promotion 2019 – 40% discount all flights! In this case you would fly from London Stansted to Istanbul on 18th of September. Your return flight from the Middle East back to the UK would be on 25th of September 2019. In this case you would easily save approx 25% off regular fare of you take the advantage of this currently promotional offer of this Turkish low-cost carrier.